genetics, whether kept indoors or not, type of diet and of course the appropriate veterinary care he/she receives. The rule of thumb is that at about age 7, a cat is considered to be middle-aged. At age 10 and above, a cat is considered to be in old age. As you can see, a seven year old cat is well into his 'forties'. 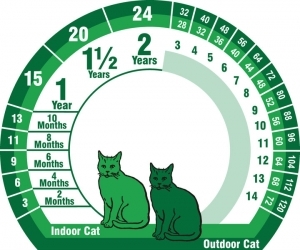 And since one year for a cat is equivalent to four human years, many changes can take place in what for us, is a fairly short period of time. That is why the American Veterinary Medical Association as well as the American Animal Hospital Association now recommend twice yearly physical exams plus appropriate blood work on all cats who are 5 years old or above. Bundled together as the Golden Years Work- Up means we can offer these tests for much less than they would cost if charged for individually.